It was so popular as a bumper sticker, we had to do it in a shirt! 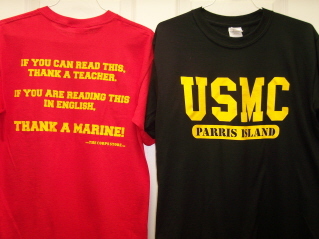 Front of the shirt says "USMC Parris Island". Back of the shirt says "IF YOU CAN READ THIS, THANK A TEACHER. IF YOU ARE READING THIS IN ENGLISH, THANK A MARINE!" Available in red or black with gold ink. Heavy preshrunk cotton t-shirt.